For those of you who may have arrived at this page via a search engine, the following couple of paragraphs serve as a synopsis of the history of this 1971 Chevrolet C10 pickup. When I purchased this C10 the interior needed to be renewed and the paint was faded but there were no major problems with the drivetrain and this suited my needs just fine being that I wanted to take care of the cosmetic aspects of the truck first and do the mechanical last. Knowing beforehand that the process of customizing a C10 according to my vision would take some time, I wanted to be able to drive the truck between the various build stages that it would go through, so it was important to me to find a C10 that met my needs and this 1971 fit the bill perfectly. For the full story on how I acquired this truck click here. This section provides comprehensive information of the performance parts currently installed on the 350 c.i.d. engine that will be removed and reinstalled on the 383 c.i.d. stroker engine. PHOTO M 24 shows the passenger side view of the 350 c.i.d. V8 engine in the 1971 Chevrolet C10 pickup truck circa MAY 2011. PHOTO M 24.1 shows a close-up of the passenger side view of the 350 c.i.d. V8 engine in the 1971 Chevrolet C10 pickup truck circa APRIL 2011. PHOTO M 24 A shows the overall view of the 350 c.i.d. V8 engine in the 1971 Chevrolet C10 pickup truck circa MAY 2011. PHOTO M 24 B shows the driver side view of the 350 c.i.d. V8 engine in the 1971 Chevrolet C10 pickup truck circa MAY 2011. In the synopsis I said I wanted to find a mechanically sound C10 pickup to customize, and I did achieve that goal by purchasing this 1971, however, just because the truck's engine was mechanically sound did not mean I was going to leave it in stock condition. The plan was to invest money in performance upgrades that could be transferred either to another engine or that could be re-installed after a rebuild of the existing engine when the time came. In other words, I had no plans to switch from a small block to a big block engine. Just because the 350 c.i.d. engine in the C10 had no major problems does not mean it did not require some repair and maintenance to make it a worry-free street machine between the various phases of the C10's custom build process. I noticed that the OEM pulley system had seen better days, the OEM Rochester 4 BBL carburetor was in need of an overhaul, the engine gaskets were seeping oil and the truck had a points-type distributor. Given that the compression was good and it did not blow smoke, what the 350 c.i.d. engine needed to make it streetable for my taste, was not too bad. So out came the engine degreaser and I went to work. PHOTO M 25 shows a Carter high performance high volume / standard pressure performance fuel pump, a Summit Racing Equipment chrome timing cover and a nodular iron harmonic balancer assembly installed on 350 c.i.d. engine in the 1971 Chevrolet C10 pickup truck. Not seen in the photo is the Cloyes double roller timing chain assembly which was installed. Since the OEM pulley and belt system was being replaced with a March Performance set-up, it made sense to do as many replacement tasks as possible for the area of the engine being exposed. Some of the oil leakage mentioned above was coming from timing cover seal and oil pan gasket, so while I had the OEM pulley system off, it made sense to go in a little deeper and repair these leaks at the same time. For example , since I was going to have to remove the timing cover to replace the leaking crankshaft oil seal and timing cover gasket, and, removal of the timing cover requires "breaking" the front oil pan front seal, ( the rear main seal was leaking and the pan gasket had excessive seepage ) and I was going to remove the oil pan in any event to correct the oil leaks there ; it was the perfect time to go in and replace other parts as well. The key to doing multiple task repairs is performing a thorough inspection and listing all the items in need of attention. Once that is done, research on the parts and cost of those parts can be done accurately. Another aspect is timeframe, i.e., how much time will it require to actually do the repair, if the vehicle is your daily driver and you plan for a weekend repair, all your ducks need to be in a row, if not, you might be taking a taxi to work on Monday morning. However, since the C10 was not a daily driver for me, I did not have to concern myself with this aspect too much, the C10 has its own space in the garage and it could remain there for as long as it took me to accomplish what I want to accomplish. Regardless, I still had to do some time scheduling as I do not like leaving internals of an engine exposed to the environment for too long a period. For example, even though I keep my garage fairly clean, if I'm doing an intake manifold change, I like to accomplish the task within a 48 hour period. Budget however is a concern, as when doing multiple task repairs, it is important to have all the parts bought and paid for and be at hand. This sometimes means waiting, and chomping at the bit, till the right amount of funds have collected. So what follows here is list and short explanation of parts replaced as I was going into the engine to correct the oil leaks. This is the type of Cloyes double roller timing chain currently installed in the 350 c.i.d. engine of the 1971 Chevrolet C10. NOTE : Prior to installing the timing chain, the stock center oil gallery pipe plug was replaced with a modified pipe plug having a 0.030 hole to provide a jet of oil to the back of the timing chain cam gear ( see previous page ). This Cloyes timing set features full roller-action double-row roller chain made from high-strength steel for superior durability. The cam sprocket is made from heat-treated ductile iron, while the crank sprocket is machined from heat-treated, high-carbon steel for strength. It has three keyways for adjustability ( 4 degrees advanced, 4 degrees retarded, and normal ). For the C10's 350 c.i.d. it has been clocked in the normal position. Astute readers of this web site will note that I have listed a new Comp Cams timing set in the 383 c.i.d. section. This is because I really don't like swapping out timing "used" timing chains from one engine to another so the 383 c.i.d. gets a new one. However, I suspect that, upon tear down of the 350 c.i.d., that the Cloyes set will still be good and most likely I'll include it with the engine when I sell the 350 c.i.d. to one of my buds who is looking for a good long block to rebuild. REF : PHOTO M 25 The chrome timing cover is an inexpensive one from Summit Racing Equipment and it too is another "sacrificial" item, as the 383 c.i.d. will have a billet 3 piece cover installed on it. Note that the ARP timing cover stud set will remain with the 350 c.i.d. engine as the Comp Cams billet unit uses different fasteners. So as much as one plans, it always seems that there are some engine items which just are not able to be transferred over from one engine to another. This is the type of Summit Racing Equipment harmonic balancer currently installed in the 350 c.i.d. engine of the 1971 Chevrolet C10 and this part will transfer over to the 383 c.i.d. 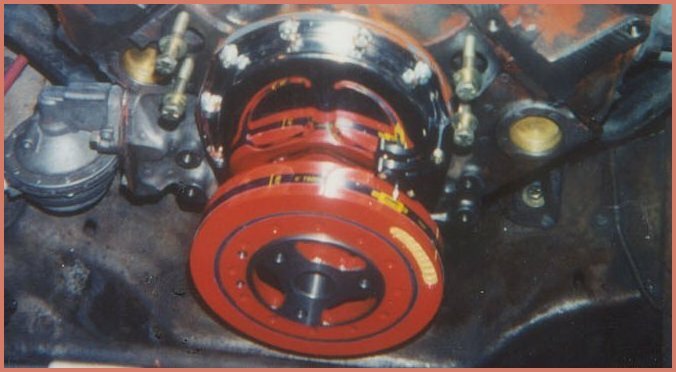 REF : PHOTO M 25 The Summit Racing Equipment harmonic balancer was given a couple of coats of POR 15 Chevy Orange engine enamel and then I added a timing tape and pointer to complete the balancer install. Even though the timing marks are engraved in the balancer, the tape makes it much easier to see what one needs to see. Knowing that I was going to replace the OEM Quadrajet carburetor on the C10, I figured it would be a good idea to replace the OEM fuel pump with a unit that had a little more push to it and I'm not speaking about pressure but rather volume. This Carter pump fit the bill perfectly having a higher flow rate than the OEM pump while its pressure output is just slightly above in the OEM range. The common mistake in fuel pump selection for street machines is thinking that higher PSI is the way to go, where the reality is that high PSI fuel pumps for street driven machines will, more often than not, blow out the needle and seat and damage the float  volume, not pressure, is the key to fuel supply in a street machine. This Carter Strip Super mechanical fuel pump flows 120 GPH from 6.9 minimum to 8.5 PSI maximum. It contains a heavy-duty diaphragm, high-speed "anti-float" spring, large "full flow" valve, a lightweight all-aluminum casting. with a tough, heat-treated lever. A big plus with this Carter fuel pump is that complete rebuild kits are available for it. REF: PHOTO M 25 Also installed but not seen is an ARP ™ 134-8701 fuel pump pushrod. It is is made of chromemoly steel, centerless ground to the precise diameter and has a hollow core to help reduce mass which prevents pump arm float and subsequent fuel starvation. This Milodon oil pan appears stock on the outside, but the oil pan contains sufficient horizontal baffling to control 100 percent of the oil, allowing an ample oil supply to the engine under all racing conditions. A Dzus-fastened, full-length windage tray is mounted in the oil pan. A major consideration when making high performance engine upgrades on a vehicle that has been substantially lowered is clearance. Considering that it has a 3 1/2 inch drop all around, a deep sump oil pan would have a very short life on this C10 . However, this Milodon circle track oil pan is a perfect fit for this type of application. PHOTO M 26 shows the Milodon oil pan installed on the 350 c.i.d. engine in the 1971 Chevrolet C10 pickup truck circa MARCH 2011. The C10 has seen some miles logged since the oil pan installation, as as one can plainly see in PHOTO M 26, there are no clearance issues with the oil pan. As far as transferring the oil pan to the 383 c.i.d. block, the current Dzus-fastened, full-length windage tray in the oil pan will have to be removed and the Milodon stud-mounted windage tray for the 383 c.i.d.mentioned in the new parts section ( previous page ) of this web site would have to be installed on the stroker engine block. Milodon's small block Chevy oil pump housing is made of a G-10 material with 40,000 psi tensile strength. G-10 is the same rugged material that brake rotors are made of. The neck is thicker than standard pumps to improve strength and end pump neck breakage under severe conditions. This high performance oil pump is engineered to perform well in low or high RPM applications and is CNC-machined for precise tolerances. Not seen in any photo but nevertheless installed was a Moroso 22070 heavy-duty oil pump intermediate shaft made of high-quality steel for extended reliability. The steel sleeve is pinned to maintain correct alignment between the oil pump and the shaft. Both these items will transfer over to the 383 c.i.d. engine block. Milodon oil pump pickups are engineered for maximum flow and long-term durability, even in the most extreme applications. All Milodon pickups use precision-bent, thick-walled tubing with a larger-than-stock inside diameter, which is heliarc-welded to Milodon's own high-flow, compact-design pickup head. All pickup assemblies then receive Milodon's gold iridited finish for corrosion resistance. It should be noted here that the flexplate was replaced at another repair interval different from engine the oil leak repair tasks I'm speaking about here. However, since I'm also listing transferable parts from one engine to another, I thought it appropriate to include the flexplate replacement here. There was nothing wrong with the OEM flexplate per se, but in this particular instance I removed the automatic transmission to replace the leaking front pump seal and while I had the transmission out I decided to replace the stock flexplate with a more heavy duty one as well. 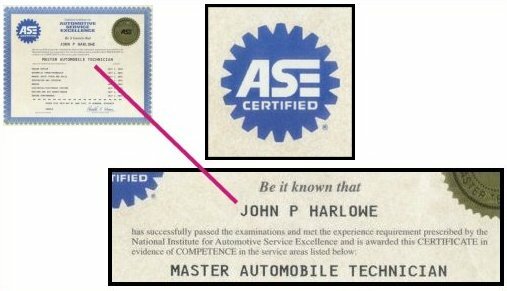 NOTE : The automatic transmission did come out a second time at a later date ( see page THREE in the mechanical section ) for its high performance upgrade overhaul. This Summit Racing Equipment Street and Strip SFI approved flexplate is built tough for racing applications.This automatic transmission flexplate is 0.35 inch thicker than the OEM version plus the flexplate is double-welded and gold iridited for corrosion protection. The starter ring is double-welded and the flexplates are double-drilled for various torque converter applications. PHOTO M 27 shows the Summit Racing Equipment 168 tooth SFI approved flexplate installed on 350 c.i.d. engine in the 1971 Chevrolet C10 pickup truck. PHOTO M 28 shows a March Performance Chevy small block serpentine conversion kit ( part number 22050 ) which retains the standard-rotation long water pump. This kit has high water flow pulley ratios for increased cooling. 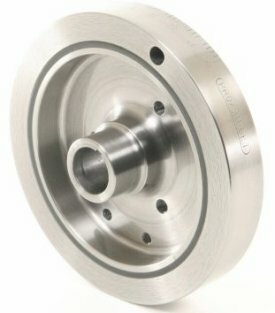 The pulleys are CNC-machined from solid billet 6061-T6 aluminum for a spectacular looking machine finish with a perfect fit and extra-high strength. All March Performance billet pulleys and brackets have a maintenance-free clear powder coating. This March Performance kit increases engine horsepower by approximately 15 HP. This kit is available with a driver side mounted A/C option should I decide to add air conditioning at a later date. This Milodon long style high-volume steel water pump features a new casting, a large-diameter shaft, heavy-duty bearing and is direct factory replacements with OEM hose connections and bosses.This high-volume pump has a balanced distribution design, i.e., equal flow to both sides of the engine block, and a high-efficiency impeller that increases coolant flow up to 30 percent over a OEM water pump. This high volume water pump increases coolant pressure in the block to prevent hot spots and air pockets and improves coolant flow in the radiator. Due to the high flow characteristics of this water pump a high flow thermostat is recommended and so a Milodon 16400 160 degree high-flow thermostat is installed in the 350 c.i.d. engine. NOTE : High-flow thermostats from Milodon greatly aid the correct functioning of a high-performance cooling system. They're engineered to warm the engine to a proper operating temperature without making it run hot enough to lose power. Also, the "Balanced Sleeve" design equalizes the pressures exerted on the thermostat. This counters the undesired effect of increased flow from a high-volume water pump, which actually tends to hold a stat closed. The OEM water pump had to be removed to gain access to the timing cover, so when the 350 c.i.d. engine was going back together it received this Milodon high volume pump as the replacement. It should be noted here that at the time of the pulley conversion the C10's OEM radiator was replaced with a heavy duty 4 core type, the heater core was also replaced and a light weight, 6 blade 17 inch stainless steel Flex-a-lite # 1307 fan replaced the OEM fan blade assembly. The Flex-a-lite wide blade flex fans build horsepower by flattening out at high RPM to reduce drag and the lightweight design helps prolong a water pump's lifespan. PHOTO M 29 shows a Perma-Cool brand 14 inch electric fan installed on the inside of the C10's 4 core radiator. Also shown is the new fan shroud assembly installed in the 1971 Chevrolet C10 pickup. To some this cooling system enhancement may seem like a bit of overkill for a vehicle, however, one must keep in mind that most of the road trips I take in the C10 are to areas like Nevada and Arizona where it can reach 120 degrees. It is comforting to know that the cooling system is up to the task of maintaining proper operating temperature at highway speed or idle conditions in traffic where the ambient temperature is in the triple digits.. I use the 14 inch electric fan at engine off at fuel stops while in desert areas to maintain heat dispersion from the radiator. The 40 amp alternator that was on the C10 when I purchased it was removed and replaced with a Summit Racing Equipment 100 AMP one wire alternator. Additionally, I fabricated a larger battery tray which accommodates a GROUP 27 style battery and it is fitted in the OEM battery location. I purchased a remanufactured HEI distributor from NAPA and then proceeded to modify it. This Hypertech coil, cap, and rotor kit is capable of increasing the output voltage of the coil so the engine can gain more power and fuel economy. The Hypertech kit is designed to produce a steady, hard-hitting spark throughout the engine's RPM range. This ACCEL ignition control module is manufactured with solid-state electronics to produce a consistent high coil output. The big advantage of this module is that the dwell control circuit ensures long, consistent coil charging sequences. Additionally, the current control circuit resists false triggering from the RFI of high-output coils. MSD's 8.5mm Super Conductor spark plug wire sets have a special helical wound core that has just 40-50 OHMS of resistance per foot ( the lowest resistance of any helical wound wire on the market today ) and having a RFI suppression equal to a 1,500 ohm wire. This low resistance results in less loss in spark energy so more reaches the spark plug. Each foot of finished wire features 40 feet of tightly wound copper for superior conductivity. This winding procedure, combined with a ferro-magnetic impregnated center core, produces an extremely effective Electro Magnetic Interference (EMI) "choke". This choke, or suppression capability, keeps the EMI inside the wire where it cannot interfere with other electronics on the vehicle. A tough, 8.5mm silicone jacket over an extra-heavy glass braid and dielectric insulator keeps the current guided to the plugs and produces a sleeve that is highly resistant to high heat as well as abrasion and tears.. Underneath the high-temperature boots, dual crimp stainless steel terminals feature snap-locks to ensure a secure fit. Additionally, I installed 1200 degree firebraid sleeves on the MSD spark plug wires for even more heat protection. I purchased a universal MSD spark plug wire kit and purposely left the wires long, knowing that I would trim them for more of an exact ( aesthetic ) fit on the 383 c.i.d. stroker when I transfered the wires over. Fill in the fields below ( example: 5000 RPM ), click calculate, and the script will show you the optimal CFM for the street and track. The ratings are different because street engines have a volumetric efficiency around 85% while racing engines are closer to 110%. At a maximum of 5000 RPM the relatively stock configuration of the 350 c.i.d. engine in the C10 requires at least a carburetor that produces 430 CFM. Lets say, when all is said and done with the 383 c.i.d. stroker high performance engine that its redline is 6000 RPM, if so, it will need a carburetor that produces 565 CFM. So it seems that this 600 CFM Holley currently installed on the 350 c.i.d. engine will do the job for the 383 c.i.d. stroker engine as well..
Let's take a closer look now at the fuel induction ( and its associated systems ) currently installed on the 1971 C10's 350 c.i.d. engine. The 350 c.i.d. engine in the 1971 Chevy C10 has a 600 CFM four barrel Holley MODEL 4150 0-4776C carburetor with mechanical secondaries, dual accelerator pumps and electric choke installed on an Edelbrock Performer intake manifold with a 1 inch open spacer. K & N Stubstacks reduce turbulence, improve metering accuracy,straighten and increase the airflow by reducing restrictions. Flowbench testing recorded an airflow increase of 28 cfm on a 650 CFM carburetor, and 40 CFM on an 850. This extra airflow builds up to 10 percent more horsepower. PHOTO M 29 A shows the Stub Stack installed on the 600 CFM Holley carb. NOTE: Base of air filter needs to be installed first, then the Stub Stack. This photo is only for a better illustration of how the Stub Stack fits to the carb. This K & N air filter assembly use a surgical cotton fabric element soaked in oil as its tack barrier. Sandwiched between layers of aluminum screen wire, the square holes in the cotton catch tumbling air and straighten it out. Since air moving in a straight line flows faster, these filters can actually improve airflow. PHOTO M 30 shows the 350 c.i.d. engine in the 1971 Chevy C10 with a 600 CFM four barrel Holley MODEL 4150 0-4776C carburetor with mechanical secondaries / dual accelerator pumps / electric choke / K & N air filter installed on an Edelbrock Performer intake manifold with a Trans-Dapt Performance Products 1 inch open spacer. A carburetor spacer increases the size of the intake manifold plenum and the advantage is that the engine will make power as if a larger carburetor was installed because there is a larger reservoir of air / fuel mixture available for the cylinders to draw from. The use of an open spacer on a dual plane manifold increases top end power by making it work like a single plane manifold. The reason being is that the two halves of the dual plane manifold are now drawing their air / fuel mixture from a common source. In effect, the two halves are no longer isolated from each other, and the effect is at its strongest at WOT during transmission kickdown. Additionally the spacer helps to insulate the carburetor from engine heat and provides more clearance for the linkage. The function of the solenoid in this application is curb idle adjustment. The curb idle set-screw on the Holley carburetor is set for approximately 500 RPM and the solenoid is set at approximately 800 RPM. The solenoid is energized at key-on and raises the throttle lever to the specified setting. Upon vehicle start-up the solenoid energized and raises the throttle lever to 800 RPM. When the key is ignition key is turned to the off position the the voltage to the solenoid is cut off and the throttle linkage falls to the curb idle screw. NOTE : On cold start the choke cam automatically brings the engine RPM up to approximately 1500 RPM and after the choke has fully opened, depressing the accelerator pedal will drop the choke cam and the throttle lever will fall to the head of the solenoid, i.e., engine RPM will fall from 1500 to 800 RPM after warm-up. This system of idle control ensures that the engine will not experience a run-on ( dieseling ) condition. This is the fresh air intake hose of the PCV system on the 1971 Chevrolet C10. The PCV system serves the purpose of exhausting crankcase pressure in the engine block created as result of by blow-by gases in the combustion process. Without an adequate means of relief from this pressure the engine gaskets would constantly leak. It is a falsehood that a PCV system has an adverse effect on engine performance. 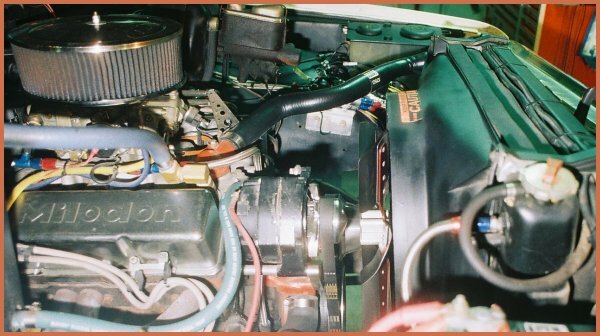 PHOTO M 30 A shows the K & N Stubstack and PCV system installed on the 1971 Chevrolet C10's 350 c.i.d. engine. January, 2012 — The valve seals on this engine were replaced as a routine maintenance item. I created a separate " how-to " web page on this procedure that details this task for others who would like to have some insight before attempting this job themselves. Click HERE to access that page. This concludes the 350 c.i.d. High Performance Parts Detailed Information section. The next section will detail information of the 383 c.i.d. stroker engine build and installation into the 1971 Chevrolet C10 pickup. Moonlight Engineering asks that you please donate what you can to support the continuation of the technical information posted on this website.